With the emergence of anarchism as a significant ideology on the contemporary left, the idea of socialist-anarchist dialogue on political issues and socialist-anarchist alliance and cooperation on issues of mutual concern has gained significant currency on the socialist left. Socialist-anarchist alliance was raised rather gushingly by Ursula McTaggart in her article, "Can We Build Socialist-Anarchist Alliances? 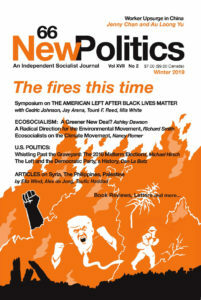 Revolution Meets Apocalypse," in Against the Current 141 (July/August 2009), more realistically and soberly by Marvin Mandell in his book review, "Anarchism and Socialism," in New Politics 47 (Summer 2009). I like to think I also contributed positively to advancing socialist-anarchist political dialogue and cooperation in my review of "Chomsky, Anarchism, and Socialism," New Politics 49 (Summer 2010). Most appropriately, Mandell ended his review cited above by writing, "I think Marxists and Anarchists can learn from each other and, in fact, need each other." Add to this literature on socialist-anarchist dialogue another contribution, this highly substantive anthology of writings on anarchist economics from AK Press, The Accumulation of Freedom, edited by anarchist activist/scholars Deric Shannon, Anthony J. Nocella II, and John Asimakopoulos. Like Shannon, Nocella and Asimakopoulos, the contributors are a variegated mixture of activist/scholars, with professional academics rubbing shoulders with thoughtful grassroots activists and organizers. Indeed, the seriousness of approach, rigor of analysis, and level of documentation and bibliography provides ample proof that scholarship is not something that only properly-credentialed academics can achieve and aspire to; thus does the book stand, both anarchist- and socialist-like, as an exemplar of the democratization and ready availability of talent among "ordinary" people. This is a book of strengths, even though many of us who consider ourselves socialists (as well as many of those who consider themselves anarchists) will question some of the analyses and approaches presented here; for there are a great variety presented, and not all authors agree with one another—yet a further strength to the book is that it does not present a uniform anarchist "party line." And while critical of socialism and Marxism in many places, the contributors often show appreciation of socialist and Marxist sources, including even for Marx himself. Where socialists are most likely to differ from anarchist economics as presented in this volume is in the impatience expressed throughout and the insistence on transformation now, action now; and many of the Do-It-Yourself (DIY) proposals advanced will strike many a socialist as hopelessly utopian in their expectations. Yet in much of the economic analyses of the evils of capitalism presented here, socialists are likely to find themselves in ready agreement — indeed, the many parallels found here between Marxist and anarchist analyses of capitalism are striking. Another point of unity for socialists and anarchists is the acknowledgement of and appreciation for Occupy movements and the grassroots protest against austerity in Greece, as well as support for factory occupations in Argentina, that are integral to the book, and an important reason for its timeliness and ready immediacy. But, though the book draws on these contemporary events to illustrate the direct applicability and relevance of anarchist economic and political analyses to problems we face today, it is not a journalistic flash-in-the-pan, a throwaway mood-piece from a fleeting present; rather, it is much more substantive than that, and is a book for our contemporary era as a whole, encompassing recent decades past and foreseeable future as well as the kaleidoscopic turn of events of the immediate time. In short, this is a book for now that is not likely to become embarrassingly dated a few years later. Most of the contributors here are communist anarchists, with a vision of a post-capitalist future that is not all that different from that of many socialists, especially Marxists, except, of course, in its denial of any role for a political state, and its emphasis on individual and collective freedom as ends in themselves. However, one of the contributors, Ian McKay, who writes "Laying the Foundations: Proudhon’s Contribution to Anarchist Economics," is a self-evident follower of Pierre-Joseph Proudhon, French "Father of Anarchism," who stressed mutual-aid banking and credit cooperatives as the basis of the new society, and tied cooperative ownership of the means of production directly to occupancy and use. Proudhon’s mutualism also infuses many of the analyses, descriptions and advocacy of direct action and DIY approaches given on a variety of subjects — from changing education to the youth culture of the punk-rock scene, from alienation and support for socialism to Puerto Rican self-determination. And while anarchists have a reputation for being woolly-headed intransigents who want all or nothing, they can also be "realistic" and "reformist" in that good sense that’s often invidiously used against socialists by the ultra-left — as evinced by Robin Hahnel’s "The Economic Crisis and Libertarian Socialists," which articulates a positive, timely, step-by-step program for dealing with the European austerity crisis which many a militant non-anarchist socialist would fully accept. Another essay here that stresses a tactical approach, though, I think, with much less success than Hahnel, is D.T. Cochrane and Jeff Monaghan’s "Fight to Win! Tools for Confronting Capital." For the most part, the essays are both deeply analytical and thoughtfully reflective, though Abbey Volcano and Deric Shannon’s "Capitalism in the 2000s: Some Broad Strokes for Beginners," despite a promising analysis, is more descriptive than analytical. Also disappointing for its overuse of rhetorical flourishes and hyperbole substituting for more rigorous analysis is Ernesto Aguilar’s "Call It an Uprising: People of Color and the Third World Organize against Capitalism." But these are the only two essays I was disappointed in; the others I found to be enjoyable and enlightening reads, even though I didn’t always agree with the authors. Indeed, once I began reading, I read it almost non-stop — I couldn’t readily put it down! The book is divided into six sections, "History," "Analysis," "Critique," "Practice," "Resistance," and "Vision," which, while separating essays in terms of major subject, also overlap and intertwine. There is also an informative Preface by Ruth Kinna and a useful, informative Introduction by the editors, "Anarchist Economics: A Holistic View," an informative Afterword by Michael Albert, "Porous Borders of Anarchist Vision and Strategy," and an ending Postscript by the editors, "Toward the Occupation of Everyday Life," written in November 2011 and clearly based on the Occupy Wall Street protest going on. These help make this book on anarchism an Everything You Always Wanted to Know about Anarchism (But Were Afraid to Ask) tome for socialist tyros as well as one for anarchists and political specialists of any stripe. There are also Contributor Biographies and a well-done index, so this is a book well put together and very complete — for which both the editors and AK Press deserve credit. The spread and limited success of Occupy has only enhanced the appeal of anarchism, which is destined not only to be around for a while, but also to fundamentally challenge established socialist thought on post-capitalist society and strategies and tactics for transformation. But we socialists should welcome the anarchist challenge, for we have something to learn from them — and they from us. All the more important for anarchists and socialists learning to talk to one another, and building united fronts in action that can actually achieve our mutual goals and usher in "the realm of freedom." George Fish is an anti-authoritarian socialist writer living in Indianapolis, Indiana, whose work has appeared in several left publications. He has also published extensively on blues and other pop music, has published poetry, and does Lenny Bruce/George Carlin-style stand-up comedy. He may be reached at georgefish666@yahoo.com.